Watercolor has always fascinated me because of its spontaneity. While painting in watercolor, numerous serendipitous events occur which result in either fantastic visual effects or disasters which necessitate placing the final painting in a place never to be seen again! Watercolor is quick and must be done in one sitting. There is no going back in watercolor. Watercolor is vibrant! The white paper of watercolor is what makes the painting sparkle. I love leaving a lot of white paper! I also enjoy painting a variety of styles, sometimes painting vignettes, sometimes using small bands of a micro landscape, and many times using exceptionally vibrant colors. I have been painting for almost twenty years and have studied under numerous well known watercolorists, including Robert Landry, Frank Francese, Milford Zornes, Tony Couch, Tony Van Hasselt, Don Andrews, Frank Webb, Joe Garcia,Duane Light, and numerous local San Diego artists. 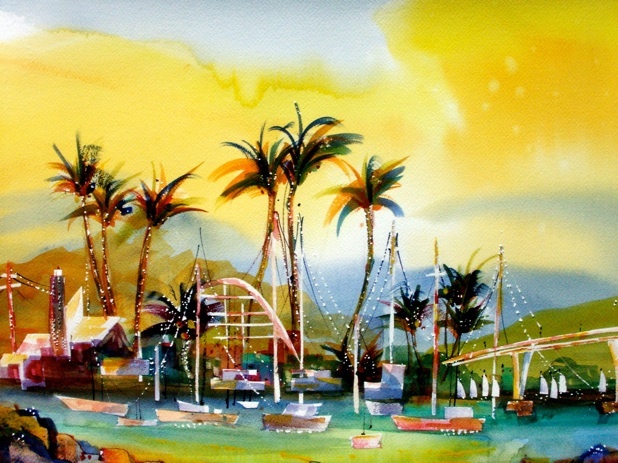 I am a member of the San Diego Watercolor Society and have participated in a variety of their workshops. I am a practicing dermatologist specializing in skin cancer diagnosis and treatment with offices in the Grossmont section of San Diego County and brighten the walls of my Grossmont office with many of my original watercolors. You can find information about the medical side of my life at www.virtualdermatology.com. I sell my originals as well as offering reproductions of my work in a variety of sizes. I can be commissioned for specific works in specific colors and should be contacted directly. I do hope you enjoy viewing the paintings on this web site which are displayed in chronological order representing the past twenty years of my artistic activity. Welcome to Dean - Art.com!